The crocuses are out, there was warmth in the air this week and all was OK with the World. Next week is the wonderful Cheltenham Festival, for me the official start of the fun part of the year (I’ll be there on Friday for the Gold Cup). I have broken my PB for most miles run in a week – I exceeded 80 miles for the first time ever. This was despite a long two day business trip to Scotland on Tuesday and Wednesday which limited my running opportunities. I was staying in Glasgow on Tuesday evening and I researched some running routes before I set off. There was a perfect looking route along the Clyde path just metres from my hotel so I got up early on Wednesday morning, aiming to get in an hour of running before heading off to my meeting in Edinburgh. That was all fine, but for one major flaw – I had forgotten to pack my shorts! Doh! With no Sports Direct stores open at such an early hour that was the end of that. After the long drive back from Edinburgh, I went down to the canal towpath in Leeds for a solo speed session of 5 x 1K. This is one of my favourite sessions and I know that if I can do all the 1K reps in around 3:35 then I am in fairly good fettle. I ran 3:26, 3:29, 3:35, 3:39 and 3:46. In common with many speed sessions, I ran the first two reps a little too hard, but the last two were uphill (there are canal locks to negotiate) and into the wind, so overall not too bad. I ran commuted to work on Thursday and was brought back down to Earth. As is my custom these days, I planned to run a longer route for the homeward leg – maybe 15 miles; however, I soon realised that I was struggling and after about 7 miles whilst on the canal, I decided to head for home. 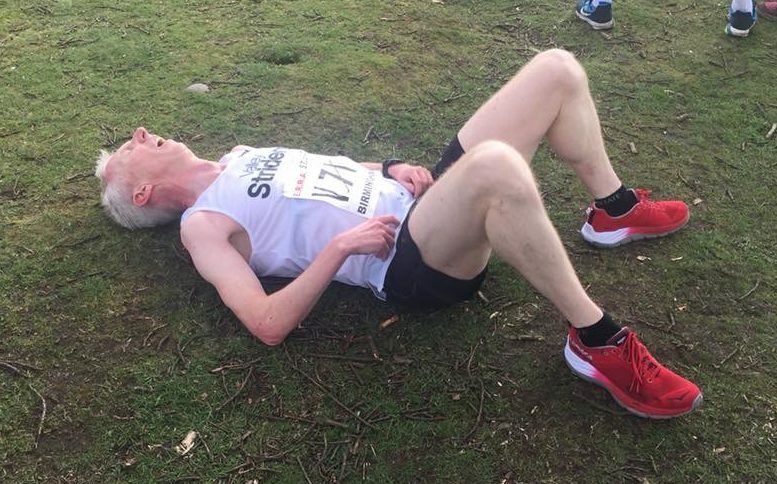 Unfortunately that involved 6 miles of near constant climbing and by ten miles I was gone, I’d hit the wall, was totally knackered, stuck in Bonksville Arizona and it was down the death shuffle for the last three miles. My last mile took me over 10 minutes. By Saturday I had recovered enough to have a go at a flat-out parkrun. I hadn’t been to my home parkrun at Woodhouse Moor (neé Leeds) since mid-January and I had missed it. A lovely early spring day was encouraging so after a proper warm up I bombed from the start, covering the first (mainly downhill) kilometre in 3:20. I felt good and was helped by two younger lads getting on my shoulder and we had a proper race for virtually the whole way around. I would put in a surge to try to shake them off, they would respond and then do the same to me. I stuck with them until about 500m from the end, and was pleased to finish 5th in 18:06. It may be a coincidence, but I checked back on my progress last year, and on the exact same weekend, I ran the same parkrun in 18:05. So clearly I am in similar shape. I did a proper long run around the reservoirs on Sunday morning – 24.6 miles. John from Valley Striders joined me for the first 13 miles (two laps) and as he headed off I felt good so decided to run at least 24 miles. I did struggle a bit towards the end, but I wasn’t really concerned with my pace, it was just good to be out for well over 3 hours. That will be my longest run pre-Manchester I think, but I may try to stick in a 30 mile run between Manchester and Comrades, we’ll see. The key to upping the mileage for me is running twice a day, but I have been careful to take at least one of the runs at true recovery pace – i.e. 8:30+ miling, basically jogging – not the 7:10 pace that some of the younger members of my club appear to class as ‘recovery’ pace on Strava (you know who you are!). Next Sunday is my pre-marathon 20 mile race – the Locke Park 20 – which is twenty times around a 1 mile loop. That will be a novel experience. It won’t be a hard race for me, just a training run with some marathon pace miles in there at some point. The following week, I will be gunning it at the Thirsk 10 mile race to see if I can get close to the hour.